Temporary images, more detailed images coming soon. Made with 100% cotton canvas and Torans, a traditional welcome cloth used by people in Gujarat at doors and gateways. 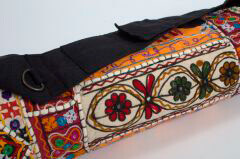 All hand made with intricate detail and embroidery, a speciality of Gujarat. Each bag is completely unique with a unique arrangement of patches and designs therefore no two bags will be alike. The images shown are to illustrate the style and variety of bags, however, the bag you receive may differ from the images shown. Please indicate in the 'additional information' section on your order if you'd prefer a light or dark design and we'll endeavour to provide you with a bag that most fits your request. Your bag will be unique! I am thrilled with the bag. It looks beautiful, is unique and has plenty of space and pockets for storing bits and bobs.